Mayor Richard W. Meehan presented a proclamation from the Town of Ocean City in appreciation to Pat Moran, symbolizing volunteerism. Mayor Richard W. Meehan presented a proclamation from the Town of Ocean City in appreciation to Pat Moran, symbolizing volunteerism. Monday September 15, 2008 was a day set aside to honor Pat Moran. Pat was invited by Mayor Fish Powell and the Ocean City Council to become a member of the Beautification Committee in 1995. Worcester County Commissioner Louise Gulyas was Chairman of the Ocean City Beautification Committee at that time. Pat served as our first Secretary and then she was Treasurer. Since the inception of the Reflections of Life project at the Convention Center, she has been its Treasurer. Pat has been a part of our two community projects, “Business Blooms with the Flower Power”, when we worked with the motels along Baltimore Ave. from 15th. St. to 33rd St. to encourage them to plant flowers in the in ground planting areas in the medians while we were waiting for that area to be redesigned and reconstructed. The second project was our 2007 “Partnerships in Bloom” where we placed planters at businesses where there was not ground for them to plant. It was an effort to beautify areas of the city that had no color or plantings. Of course, Pat was part of many Arbor Day celebrations at Northside Park. 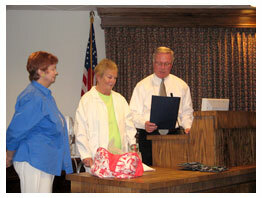 In addition to the Town Beautification Committee, Pat chaired the Caine Woods Association Beautification Committee. For a number of years Pat was responsible for planting the many lovely gardens in the Caine Woods community. She worked on the Mayor and City Council’s Open House on New Year’s Day. Pat was the co-chair of that event for several years including the millennium. The committee wishes Pat and her husband Ed well as they leave Ocean City.